Yesterday we all celebrated 69th Republic Day. It is a day to remember when India's constitution came into force on January 26, 1950, completing the country's transition toward becoming an independent republic. So i utilised this day by spending some quality time with my family and ofcourse my favorite card making but was unable to post. So today i will be sharing with you a card which i made from a Floral Zen Stamp from Peekaboo Designs. The idea has been running to my mind from few days. You can have a look to the card below. Nothing much about this card but i wanted to use this stamp with the kraft paper and white embossing powder to see how it looks and i am very happy with the outcome. I hope you also liked the card! I do like this clean, simple design on kraft with gold! Nicely done. Thanks so much for playing along with The Male Room. Deborah, DT. Thankyou Deborah for your kind words! Thanks for playing along with the Peek-a-boo Designs Challenge. Thankyou so much Preeti! You are the inspiration..
Beautiful take on the Kraft! Love it! Thanks for playing along with Peek-a-boo Designs Challenge. Beautiful card! My favorite stamp set as I've designed this one. Thanks for playing along PABD January challenge. White embossing on kraft is one of my favourite looks. Your card is simply beautiful. 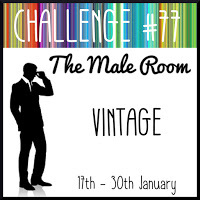 Thanks for playing along at the Male Room Craft Challenge. Good Luck! A beautiful card, white and kraft look so good together. Thank you for joining us at TMR.